The advances in biomedicine over the past decade have provided revolutionary insights into molecules that mediate cell proliferation and differentiation. 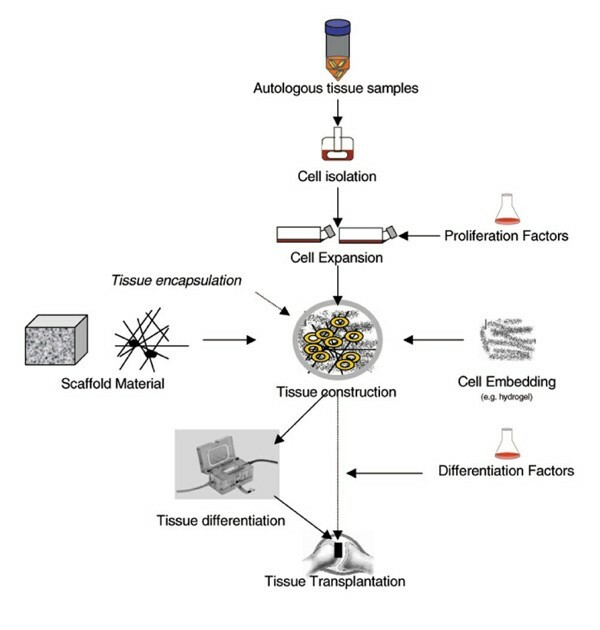 Findings on the complex interplay of cells, growth factors, matrix molecules and cell adhesion molecules in the process of tissue patterning have vitalized the revolutionary approach of bioregenerative medicine and tissue engineering. Here we review the impact of recent work in this interdisciplinary field on the treatment of musculoskeletal disorders. This novel concept combines the transplantation of pluripotent stem cells, and the use of specifically tailored biomaterials, arrays of bioactive molecules and gene transfer technologies to direct the regeneration of pathologically altered musculoskeletal tissues. During the past decade new and exciting strategies have emerged that will revolutionize the treatment of patients suffering from failure of vital structures. The science fiction scenario of regenerating damaged organs or even creating a completely new tissue was brought to life with the concept of tissue engineering. The basic knowledge gained in the fields of cell and molecular biology, combined with the impact of biomaterial research, has provided the essential tools to bring about a practical approach to bioregeneration. Tissue engineering procedures focus on the delivery or in situ mobilization of cells capable of restoring the pathologically altered architecture and function. This approach comprises the interactive triad of responsive cells, a supportive matrix and bioactive molecules promoting differentiation and regeneration. The strategy of a directed regeneration of musculoskeletal tissue damaged by trauma, chronic inflammation or degeneration will perfectly supplement the treatment, once approved, with the new biological therapeutics in rheumatology. Musculoskeletal structures such as joints are composed of various specialized mesenchymal cells, which manage individual biomechanical requirements by a finely tuned turnover of their extracellular matrix . Tissue damage results from a major pathological impact and inappropriate repair. Tissue engineering techniques attempt to direct and optimize the regeneration of altered tissue. Thus, non-penetrating cartilage defects do not heal adequately, owing to the lack of mobilization of chondrocytes from the vicinity of the defect and the inaccessibility of chondroprogenitor cells from the bone marrow . So far, most approaches for tissue repair have used the transplantation of differentiated autologous cells, obtained from biopsies of the corresponding tissue. For cartilage repair this approach was performed by Brittberg et al , who injected a suspension of previously isolated and in vitro amplified autologous chondrocytes under a periost flap into the cartilage defect. The disadvantages of this procedure are obvious: the limited availability of cells, the morbidity at the donor site and the restricted potential for proliferation and subsequent differentiation. Novel strategies focus on the transplantation or in situ mobilization of mesenchymal precursor or stem cells. These versatile cells are easy to obtain, have an expanded proliferative capacity and the potential to differentiate into bone, cartilage, muscle and tendon, depending on positional cues and the corresponding microenvironment . Mesenchymal stem cells reside mainly within the bone marrow but have been isolated from the connective tissue of almost every organ, suggesting a role as a reservoir and regeneration pool for the various mesenchymal tissues . Several experimental studies have been successfully completed to evaluate the potential of mesenchymal stem cells for their feasibility and efficacy in healing cartilaginous, osseous, tendon defects or even in treating genetic disorders such as osteogenesis imperfecta or Duchenne's muscular dystrophy [6,7,8]. An alternate approach might circumvent the cell transplantation procedure with a direct stimulation and mobilization of the progenitor cells of residual tissue. Thus, local tissue turnover and repair activity involves four steps: first, chemoattraction of mesenchymal progenitor cells from resident sites such as bone marrow and synovial membrane or distant reservoirs; second, condensation of cells via upregulation of essential cell adhesion molecules; third, local proliferation; fourth, subsequent differentiation. The direction and management of this complex process can be achieved with the controlled release of individual bioactive molecules, which might include growth factors, cytokines, cell adhesion molecules and chemokines, or a subset of these, and the use of specially designed scaffolds guiding this process both temporally and spatially. Regeneration and tissue repair seem to involve similar cellular transitional events to those observed during embryogenesis. However, the pace of these events in tissue homeostasis in the adult organism is much slower, and the decline in uncommitted progenitor cells and lack of corresponding signals, prevent effective rejuvenation or complete regeneration of the tissue. A complex network of bioactive molecules, with emphasis on bone morphogenetic proteins(such as BMPs 2, 4 and 7), growth and differentiation factors (such as GDFs 5 and 6), are known to orchestrate osteochondrogenic morphogenesis  as well as tissue homeostasis . However, their pattern of expression during bone and joint disorders is still an enigma. Closely related factors exhibit differential effects, which might be synergistic, sequential, overlapping or antagonizing. This might depend on the complexity of homodimerization and heterodimerization of individual BMPs, the promiscuity of binding to different types of receptors, or the different pathways of intracellular signalling [11,12]. Furthermore, matrix molecules and membrane-bound components are likely to modulate the activity of growth factors . In view of this confusing complexity it is obviously quite difficult to find the right factor to initiate the effect desired. Several studies with the incorporation of BMPs in carrier structures resulted in better and faster healing of cartilage and bone defects . However, advanced approaches will probably use a specially tailored array of bioactive factors that separately address cell migration, proliferation, differentiation and tissue maturation. Moreover, these aspects have to be considered during the formation of cartilage and bone transplants in vitro. Bioreactors and perfusion systems closely mimic the situation in vivo with the essential extracellular matrix environment and biomechanical influence, and ensure the establishment of an artificial cartilage or bone tissue . 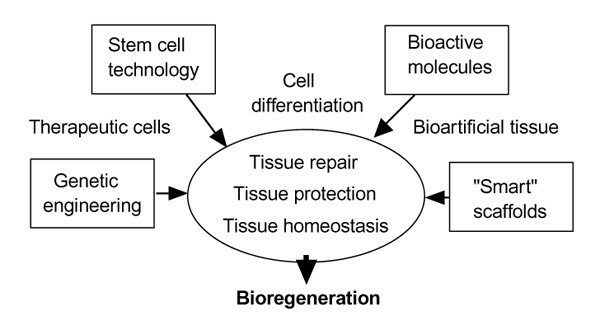 Specifically tailored biomaterials are crucial tools in tissue engineering (Figure 1), which have to provide biocompatibility (which means not eliciting an inflammatory reaction or immunorejection), biodegradibility and a variable design, that depends on the biomechanical profile of the anatomical situation in question. Moreover, they have to ensure an adequate cell distribution, new matrix formation and tissue integration, thus simulating an ideal embryo-like environment. This might be achieved by solid resorbable polymer scaffolds (polylactid acid, polyglycolic acid, polyethylene or polypropylene) or other porous structures, which could be combined with hydrogels such as agarose, fibrin or alginate [16,17]. The encapsulation of scaffolds with semipermeable membranes will keep synthesized proteoglycans and collagens inside the tissue and will provide additional immune protection . Structural deficits of bioartificial tissues established in vitro, including the lack of any polarization, fibril orientation and cell orientation, might be improved with new, `smart' polymers. Chemical modification with the incorporation of functional groups, side chains [the Arg-Gly-Asp (RGD) sequence], mimetic substances, matrix proteins (hyaluronic acid and tricalcium phosphate) or cell adhesion molecules will transform simple cell carriers to dynamic structures adapting to natural forces and requirements and thus guiding cell differentiation and matrix formation. Combination with release systems (for example microspheres) for growth factors along gradients will enhance appropriate tissue development . The spectrum of clinical applications includes the repair of critical bone defects resulting from trauma, infection, congenital malformation, tumour or insufficient endoprosthetic surgery  and the restoration of cartilage in destructive joint diseases or traumatic injuries. Bone reconstruction was performed successfully with the transplantation of pluripotent osteogenic cells in a polymer, collagen or ceramic scaffold in several studies . On the basis of the regenerative potential of bone marrow stromal cells and periosteal cells, the implantation of scaffolds with incorporated morphogenic factors (transforming growth factor, BMP) indicated sufficient osseous bridging and bone formation . For the replacement of joint cartilage, pressure resistance and fixation of the transplant to the bone is even more important. At present, studies are performed on a heterotopic transplantation or extended cultures in vitro with hyaluronic acid to address the biomechanical problem. Another alternative is the establishment of osteochondral transplants, which consist of artificial cartilage tissue cultured directly on porous calcium carbonate  to achieve a permanent, solid connection between cartilage and bone tissue. Ligaments and menisci are often victims of ambitious sport and exercise activities and exhibit a poor intrinsic healing capacity. The transplantation of fibroblast-seeded scaffolds cultured under specific biomechanical conditions (tensile strength) and under the influence of growth factors seems an auspicious alternative to present procedures [24,25]. Further efforts will be directed at the repair of damaged and degenerated spinal compartments, for example the implantation of cell-gels or the application of growth factors such as BMPs 2 and 4 to restore intervertebral discs. Musculoskeletal structures such as the joint are a morphological and functional unit, so pathological changes occurring for instance during osteoarthritis are never restricted to a single tissue. For a sustained balance of homeostasis, future approaches will have to focus on the regeneration of complex structures with different tissue types. Genetic engineering, a hybrid of tissue engineering and gene therapy, will give a further stimulus to regenerative and reparative approaches . The functional properties of mesenchymal stem and progenitor cells (periosteal cells) make them ideal candidates for genetic engineering, to enhance the process of tissue regeneration and repair, and to deliver essential biological factors to restore and maintain tissue homeostasis (Figure 2). Regenerative and anti-inflammatory potency of the transplant can be achieved by transferring genes of the transforming growth factor-β superfamily (such as BMPs or their receptors) [27,28]. The technique of gene therapy (ex vivo or in vitro) has the particular advantage that a defined population of cells is genetically modulated, and the effects and dosage for optimal differentiation and protection can be controlled. Important considerations are the stability of gene expression, immunogenicity of the vector, transfer efficiency, dependence on cell proliferation and the size of genetic material transduced. Moreover, plasmid DNA can be delivered directly from polymer matrices, leading to the efficient transfection of a large number of cells . The systemic delivery of therapeutic cells, with emphasis on genetically modified stem cells addressed to specific `homing' sites throughout the body, might provide new avenues for the treatment of systemic diseases such as osteoporosis. The innovative tissue engineering tools have established tantalizing possibilities for the manipulation of cell destiny in a predictable way: stem cells with their flexible regenerative potential, tissue-inductive factors, advanced biomaterials and gene transfer technologies will dramatically amplify our therapeutic abilities in treating musculoskeletal disorders and will break new ground in bioregenerative medicine. General procedure for engineering of bone and cartilage transplants.